How much mountaineering experience do I need in order to climb Mt. Elbrus? What about the snowcat ride some people take on summit day? Do you have assistant guides to take someone back down, should they become ill upon ascent and require descent? What if one or two people in the group are slower than the rest? Any suggested reading I should do before taking this trip? 1. How much mountaineering experience do I need in order to climb Mt. Elbrus? 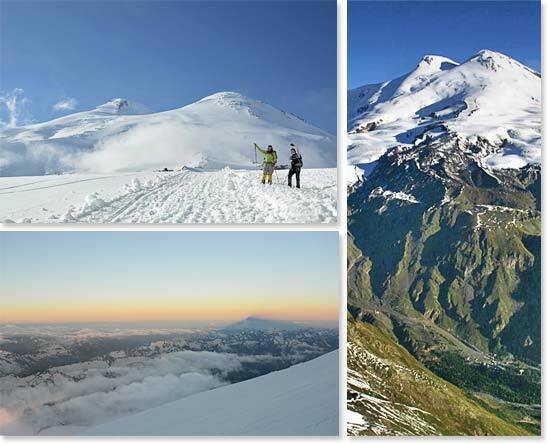 Elbrus is a glacier climb of easy to moderate difficulty. Prior climbing experience is not required for this trip. You will wear crampons during the ascent. If you have not been to altitude before, know that 18,510ft/5,642m is high enough that you will need to pay attention to your body's ability to acclimatize. 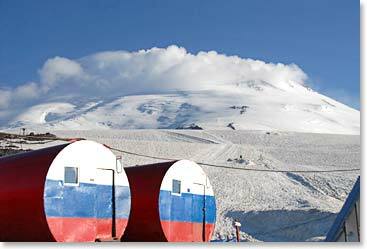 Weather is a factor on Elbrus or on any big mountain. Your guides will pay close attention to weather and visibility on the summit attempt. You will gain valuable experience; dressing properly for alpine conditions and navigating on glaciers. Summit day is long. During the climb we spend time acclimatizing and training as we hike in the mountains of the Elbrus region. These will be rigorous day trips, but we will return each night to our hotel. 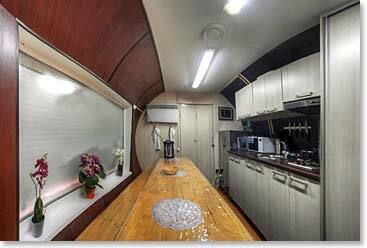 On the mountain we stay in the "Barrels" instead of in tents - here is our kitchen. We will enjoy meals at fine restaurants and hotels in St. Petersburg and Moscow. We will eat simple but nutritious and filling (lots of potatoes, great bread, soups, small portions of meat) meals at our hotel in the Caucasus. We will take a Russian cook when we move to the hut on Elbrus. The cook will prepare hearty, simple expedition meals. Also, we always provide snacks and treats along the trail. If a Snickers bar, peanut butter, or cheese is a satisfying snack, you will be happy. 4. Which kind of weather should I be expecting? Moscow and St Petersburg are typical of other northern European cities in the summer. It can be hot in midday, but evening temperatures, especially along the Baltic Sea in St. Petersburg, might be cooler. Remember that there is very little darkness at 60 degrees north in summertime. The Caucasus Mountains have classic variable mountain weather, warm in direct sunlight, cool on cloudy days and at night. You will be adjusting your layers all day as you climb and hike. Elbrus summit days can be windy and cold, as well as hot. 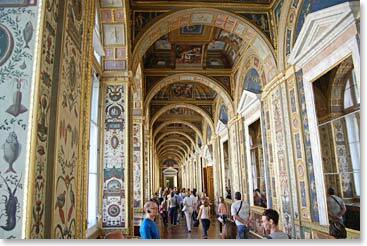 In our opinion, no trip to Russia is complete without a visit to St. Petersburg. The midsummer weeks of the “White Nights” are when the city is in a festive mood to celebrate the around-the-clock daylight at 60 degrees north. One feels Russia's history as a tangible and living presence on these storied streets. The opportunity to walk out of our hotel and visit the Hermitage, a host of historic and cultural sites that rival any other location in the world, is not to be missed. 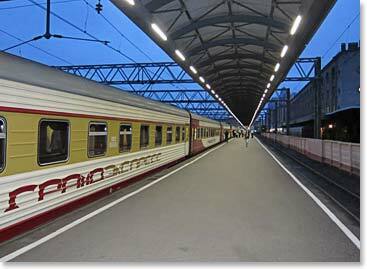 We also enjoy boarding the midnight-night train to Moscow for our journey to see Russia’s other great city and visit the Red Square. 6. How much money do we need to bring? St. Petersburg and Moscow are often more expensive than people expect. Prices here are in line with London or other European cities. Moscow is considered one of the most expensive cities in the world. Our approach is to put our groups in the finest locations, which allows us to be within walking distance to the main sights. Nevsky Prospect and the Red Square are worth it! 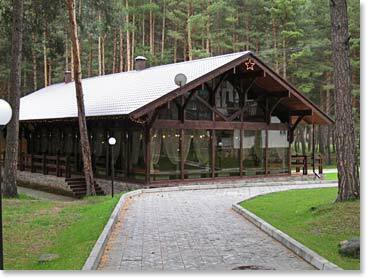 Once we head to the Caucasus, however, you’ll find little opportunity to spend money. Meals are all included and besides a small souvenir, a bottle of soda pop, or a beer, your cash expenditures will be low. Expect to spend around 400 Euros, or between 500 - 600 USD in cash on your trip; including tipping local staff at the end. You can spend less and might well spend more, but this is certainly enough. Remember that you can use credit cards in the cities, but we recommend having cash as well. 7. What about the snowcat ride some people take on summit day? 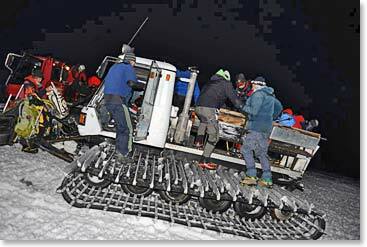 We offer to take a snowcat from Garabashi Huts (12,303ft/3,750m) to Pashtukov Rocks (15,615ft/4,759m). This gets us up to the real climbing faster. The remaining long climb through the saddle and on the West summit will not be diminished by this early morning assistance. Each climber will already have travelled the glacier between the huts and Pashtukov Rocks on foot at least once during the acclimatization hikes. 8. Do you have assistant guides to take someone back down, should they become ill upon ascent and require descent? We take multiple guides on summit day to allow various different rate of ascents and allow turn around options if necessary. 9. What if one or two people in the group are slower than the rest? 10. Any suggested reading I should do before taking this trip? 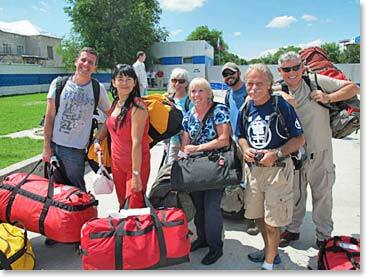 Knowledge about a country’s history, language and culture greatly increases the traveler’s experience. Even the smallest bits of information on language and culture can open many doors and allow diverse communication between guest and host. Please refer to the "Reading List" page for our recommended reading.